Looks good, easy to use, reliable. A touch on the small side for larger families and for those who have large dishes / plates. 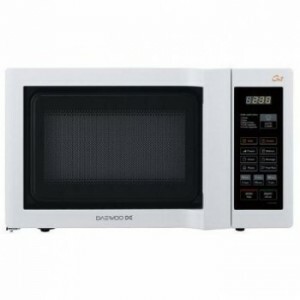 Priced at around £55, the Daewoo KOG6L6B is a relatively small white microwave, offering an overall 20 litre capacity, as well as 800w of microwave power and a 1050w grill from within it's white body. It is ideally suited to those with smaller kitchens, where space is of a premium, and measures 27cm by 45cm by 33cm. The dual wave system features 10 different power settings, ranging from defrost to high, which is powered by a maximum of 800w when in microwave oven mode. The Daewoo grill system worked well, providing 1050w of power, and as such will be perfectly functional for when you don't have access to a regular grill. The white exterior looks smart, and will suit those who wish their microwave to match the rest of their white kitchen suite. It may struggle to fit the largest of plates and dishes, but will accommodate the majority - those with larger families may wish to look for a larger microwave though. The controls were simple to use, and overall performance was good, and considering the relatively small price tag, it offers great value. The Daewoo KOG6L6B is an ideal grill microwave for those with smaller kitchens, or for those who require a reliable grill microwave on a budget.